Greetings from 37,000 feet. As I write these words, I am on my way from San Francisco, California, to Boston, Massachusetts, to participate in a two-day workshop at Harvard, sponsored by the OECD (Organisation for Economic Co- operation and Development), to look at what should go into the math tests that will be administered to children around the world for PISA 2021. PISA, the Programme for International Student Assessment, gets such extensive press coverage each time one of its reports is published, that it really needs no introduction. Americans have grown used to the depressing fact that US school children invariably perform dismally, ranked near the bottom of the international league tables, with countries like Japan and Finland jostling around at the top. But chances are you have not heard of PIACC – the Programme for the International Assessment of Adult Competencies. The OECD introduced this new program a few years ago to investigate the nation-based adult skillsets that are most significant to national prosperity in a modern society: literacy, numeracy, and problem solving in a technology-rich environment (PS-TRE). Whereas the PISA surveys focus on specific age-groups of school students, PIAAC studied adults across the entire age range 16 to 65. The first report based on the PIAAC study was published in fall 2013: OECD Skills Outlook 2013: First Results from the Survey of Adult Skills. A subsequent OECD report focused on PIACC data for US adults. The report’s title, Time for the U.S. to Reskill, gives the depressing-for-Americans headline that warns you of its contents. The skill levels of American adults compared to those of 21 other participating OECD countries were found to be dismal right across the board. The authors summarized US performance as “weak on literacy, very poor on numeracy,” and slightly below average on PS-TRE. “Broadly speaking, the weakness affects the entire skills distribution, so that the US has proportionately more people with weak skills than some other countries and fewer people with strong skills,” the report concluded. I have not read either OECD report. As happened when I never was able to watch the movie Schindler’s List, it is one of those things I feel I ought to read but cannot face the depression it would inevitably lead to. 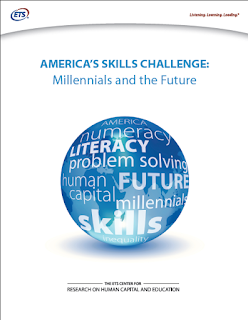 Rather, for airplane reading on my flight from Stanford to Harvard, I took with me a recently released (January 2015) report from the Princeton, NJ-based Educational Testing Service (ETS), titled AMERICA’S SKILLS CHALLENGE: Millennials and the Future. The ETS report disaggregates the PIAAC US data for millennials—the generation born after 1980, who were 16–34 years of age at the time of the assessment. The millennial generation has attained more years of schooling than any previous cohort in American history. Moreover, America spends more per student on primary through tertiary education than any other OECD nation. Surely then, this report would not depress me? I would find things to celebrate. A central message emerging from the ETS report is that, despite all the costly and extensive education, US millennials on average demonstrate relatively weak skills in literacy, numeracy, and problem solving in technology-rich environments, compared to their international peers. Sigh. And this is not just true for millennials overall, it also holds for our best performing and most educated young adults, for those who are native born, and for those from the highest socioeconomic background. Moreover, the report’s findings indicate a decrease in literacy and numeracy skills for US adults when compared with results from previous adult surveys. In literacy, US millennials scored lower than 15 of the 22 participating countries. In numeracy, US millennials ranked last. In PS-TRE, US millennials also ranked last. The youngest segment of the US millennial cohort (16- to 24-year-olds), who will be in the labor force for the next 50 years, ranked last in numeracy and among the bottom countries in PS-TRE. US millennials with a four-year bachelor’s degree scored third from bottom in numeracy. US millennials with a master’s or research degree were fourth from bottom. In their own way, each of these countries seems to be doing education better than we are. Yet here’s the fascinating thing. I’ve spent time in all of those countries. They each have a lot to offer, and I like them all. I also was born and grew up in the UK, moving to the US as an adult in 1987. I am a lifelong educator. But for all its faults (and its education system is just one of a legion of things America does poorly) I’d rather live where I do now, in the USA, with Italy in second place. But that’s another story. A complicated story. (If you think California is a separate nation, and in many ways it is, then my preference statement needs further parsing.) Doing well on global tests of educational attainment is just one factor that we can use to measure quality of life.